Welcome back to the NFL Talk Plus Show here on the Warlock Hour Network. I know we keep saying this, but life just has a way sometimes in getting in the way. We are definitely going to try to a bit better going through the rest of the off-season, though we do know Keith will be enjoying Wrestlemania LIVE in New York, so that week may be a shut down week. We do have a good show for you this week talking about some of the biggest moves of the off season so far. We also promise to bring back our mock draft in the coming weeks. We thank you for listening, and hope you enjoyed the show. NFL Pick ‘Em Season 6 Week 4 – The Upset Train Is Running Full Steam! Another week in the books, and with all the upsets last week and the upset master Tyler making them, he’s claimed top spot. Tyler went 11-5 last week to claim the top spot overall. The upset train left the station last week and now it’s running full steam ahead. This week we continue that ride as we talk about all the upsets from last week and what we hope to see this week. Hope you enjoy the show, and return again next week! NFL Talk Plus Episode 74 – As The Gruden Turns! 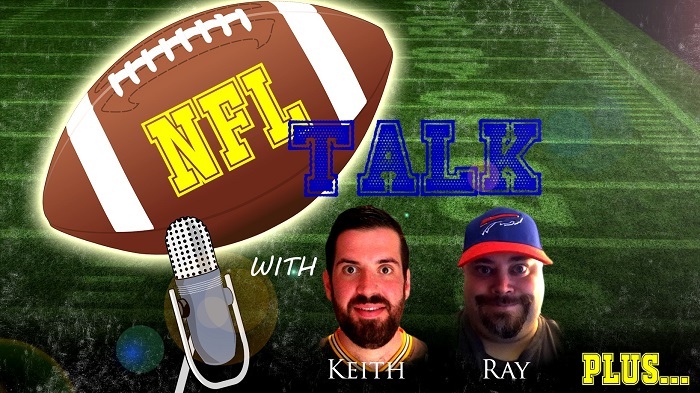 NFL Talk Plus Episode 74! Another week of the NFL season is in the books, and with the later recording time this week, Week 3 has already begun. Keith and I talk about three games this week as we include the Browns first win in 635 days. We then choose three games to talk about next week as well. Plus all the news of the week from the NFL, including the trading of one of the leagues top receivers for a bag of peanuts… not really, but you’ll find out when you listen to this week’s episode. Hope you enjoy the show, and come back next week for more! NFL Talk Plus Episode 70! Keith and I return to form a bit this week as we discuss the news of the week around the NFL. Surprisingly, there were a few things to talk about that we actually made a full fledged podcast. This show was recorded Wednesday, so we hadn’t seen the newest Hard Knocks episode, but we do discuss what has aired. So check out the week’s news as we continue to prep for the season… now less than 13 days away. NFL Talk Plus Episode 67! NFL Talk Plus Episode 62! WE are now past the NFL Draft. This week’s show is a long one as we bring you the news of the week and then delve into a bit of a break down of the first round of the draft. We did pre-record this show earlier this week, so there has been news since… however, we still hope you enjoy this week’s show. There will be a bit of a break as I go on holidays, but rest assured, Keith and I will be back at it in a couple of weeks time. Enjoy the offseason and the show. NFL Talk Plus Episode 60! This week Keith and I return for some news from around the NFL. However, we know that you’re really here this week to listen to the next section of our Mock Draft. We also, diverge off on some tangents… but hey, we have fun doing this. We actually shock ourselves by making some similar picks at the same place. Just goes to show how much we think alike when it comes to football. So give a listen as we make picks 11 to 20 this week.